I cannot stop thinking about getting a puppy. I know this is absolutely nutcase talk here because I just had a baby but seriously I want one. I have always wanted a family dog - another member of our clan. Someone that my children will grow up with, love, befriend. I always thought I wanted a golden retriever (perfect family dog, right?). Then I wanted a beagle (adorable, friendly and energetic). 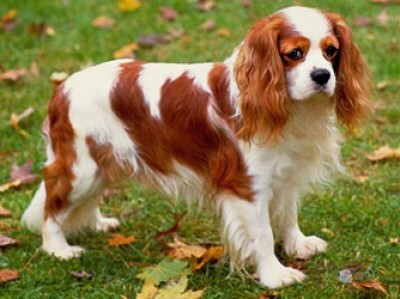 The other day I was researching great family dogs and came across the Cavalier King Charles Spaniel. You guys, I am in love. We aren't in a position to get a dog quite yet but it doesn't hurt to dream and prepare myself for one! I mean, I spent my whole life preparing to be a mother to human babies so I better prepare to be a mother to a canine baby, right? Anyway, how about some advice from my dog-family readers. Do you have a dog (and if you have a Cavalier King Charles Spaniel please tell me about your experience with them!) and when we get a dog how does one train them? We got our first family dog when our daughter was about 6 months. While I love him dearly, I'd NEVER do that again! Animals are so much work, they only give you as a mother more work. Vacations become harder, especially if you can't take them with. If they're a pup, or just untrained, there is all the time that goes into training... I could go on, I won't though.. With that said, my daughter is now 21 months and LOVES him. He's become less work but not by much. Yeah Sara, we definitely won't be getting a dog anytime soon. Our current situation (renters, new baby, cost) is prohibiting us from getting a dog for at least a few years. But it's fun to think about and prepare for. What kind of dog do you have? We have a chihuahua. He is sweet as can be, so mellow, and loves our daughter. It's turned out for the better. The hardest part is getting a pet sitter for when we're on vacations! Oh my goodness - they are the BEST dogs! My in-law's live in San Diego and have 2 Cavalier's. They are very well behaved, great around my 1-year old, and the perfect size. We always leave our visits wanting one. When my son was 6 months, both dogs were great around him - they are incredibly lovable and oh-so cute! This post makes me wish I lived in SD...feel like we would be kindred spirits! Obviously you can't do this if you REALLY want a specific breed, but I am such an advocate of adopting rescue dogs! I don't mean to get all animal rightsy on you, but there are just so many dogs that need homes. One of the best parts of adopting a dog is most of the time they've already been fostered in a home so they can give you a good idea of the specific dog's personality, likes, dislikes, etc, which can vary a lot even within a breed. You can definitely get a lot more info than you can about a brand new puppy and guess what, a lot of times you can find one that's already potty trained but still not very old so you'll have a long time to love them in your family. Plus you'll feel so good knowing you've made that little doggy's life a whole lot better. i agree, ashley. we adopted our current dog, as i mentioned above. and it was nice because he was nearly completely housebroken and we knew more about him than i would a 6 week old purebred dog who hasnt had any "life experience" yet :o) uhm ... and ps, much less expensive! we got nashdee for $100 "adoption donation", which included neutering, and all his up to date shots. my inlaws just got a purebred lab, and spend a whopping $1500!! dang! :o) but - to each his own. if thats what youre into, go for it. im just not that type, i guess! I have a Cavalier named Ella. She's a ruby and she's WONDERFUL. They are the BEST family dogs--smart, sweet, playful, affectionate and incredibly gentle. I have an 11 month old and they just LOVE each other. Kalen (my son) is learning to play fetch with her and she couldn't love it any more. I can't recommend them enough; I will never get another breed of dog. My parents got me this breed of dog when I was in 5th grade. He was the BEST dog ever. I took him everywhere with me. You do need to be consistent with a dog...and start training them the way you want them to be right away! My family has had a Cavalier for 10 years. He is very sweet and gentle; not too energetic and good with toddlers. I think it's a great choice! I have a pug and she is so gentle and loving with my 11 month old but she is about 8 now so she is practically an old lady and very calm. 2 of my sister in laws have King Charles Cavaliers and they are both good with their kids but did take quite a bit of training be use they started out pretty hyper but as long as you stay consistent with any dog they are pretty easy to train. When my oldest daughter started asking for a dog, we told her when she turned 8 we could get one. Now she is 6, and we're wondering if we could push it to 10. Probably not. My husband's boss has a King Charles and we have dog sitted a couple of times. She is so good with the kids. Never barked or growled at the kids. We were never worried she would bite. However, they do shed, and my husband is allergic, so we will be getting a hypoallergenic dog. Other than how the dog is with kids (which is of course super important), also consider if the dog will need to be groomed regularly (extra money), the kind of diseases they get (sad when that happens and also costly even if its something as simple as allergies), how much food they eat (money again), and their life span. Good luck! 2). You can't leave town or be gone all day without getting a dog sitter. 3). They can't talk and when they are sick or hurt, you worry about them like child. 4). The need exercise and discipline and will be naughty if you ignore them. I instituted a rule in our home. We could get a dog when the kids were potty trained. LOL, I held to it. We got Harry when our youngest was potty trained. Harry, an English goldendoodle, just turned 2. We picked goldendoodle because we have allergies in our family. Also, goldendoodles do not shed, thank goodness. But they do need grooming. I began training him the week we got him. I trained him for 6 months. Now he is amazingly well behaved. When we talked with our breeder and she asked what we were looking for, I said "the calmest thing you've got." With energetic small children, I wanted a nice calm family dog. I never saw any of the other puppies from Harry's litter and I am glad. I'm certain I would have fallen in love with the most hyper if I'd tried to pick him our myself. We have a cockapoo (cocker spaniel and poodle mix) named Moose who is 10 months old now and wonderful!! I couldn't handle a shedding dog, and he doesn't shed at ALL- and his fur is SO soft. He is also the perfect size (21 pounds), loves to go for walks, but also sleeps most of the day away if we're not playing with him. We used the book "How to housebreak your dog in 7 days" and while it was tough to stick to the schedule when he was little, it really did work! But I would second what everyone else mentioned about how dogs can make going out of town or being away from home the whole day very difficult. And puppy vet bills can add up! But I wouldn't trade our little guy for anything!! We don't have kids yet, so he is definitely my baby! We are currently watching a Cavalier for 2 years for a friend who is temporarily in Australia. I'll just warn you that they are EXTREMELY clingy. I think they were bred to just sit next to royalty so fleas would jump from the people to the dogs, seriously. If you are more independent and don't want to be followed around 24-7, I might think about a different breed. He also sheds like crazy. That being said, he's great with our 21 month old and basically lets him do whatever he wants to him. I also wouldn't say they are smart like one of the posters above mentioned. This one is really only smart when it comes to stealing food and trying to eat the garbage. Sorry to be a downer, but you should know what you're potentially getting into. We got our very first "family dog" last spring. The only dog I said I would ever get was a Cavalier King Charles, so we brought one home in the Spring of 2011. He's 1.5 now and such a wonderful dog!!! They are lap dogs for sure! The moment I sit down, he wants to be on my lap! He is my shadow all day long, just following me room to room. Sweet, sweet disposition, easy to train, travels well and just an all-around perfect dog!! It is a great choice with your little boys!! Low maintenance too. I get him groomed every 3 months, we cut his hair short in the summer. Doesn't like to walk very far. Seriously, the cutest puppies ever! Good Luck! I am in love with Great Danes. My sister-in-law (that I live with) just got a Great Dane puppy and a Boxer puppy. The Boxer is a maniac!!!! Non-stop crazy! Which is great if you like hyper, which I don't. Her Great Dane puppy just wants to cuddle and lay quietly at my feet, which I love!! She never wants to leave your side, so even as a puppy a leash isn't ever necessary, and she's just so insanely calm and lovable. It's like a huge throw pillow in the shape of a dog :) And it's not super good for them to be walked until they are older so easy maintenance. Dang, Liz, then we won't ever be able to visit you! :( Paul is so allergic, he can't breathe around dogs, even "hypoallergenic" ones. It's so sad. Many pure-breed organizations have adoption opportunities on their websites because they don't want the pure-breeds to end up in a shelter and possibly be put down. Years ago I adopted a 4 year old Siberian Husky through a SH rescue site.